Updated Tuesday March 27, 2018 by Tony Paterno. Exciting News for Rye Brook Youth Soccer! Sports Illustrated Play has released their new app, replacing the old "Team Wall" app. 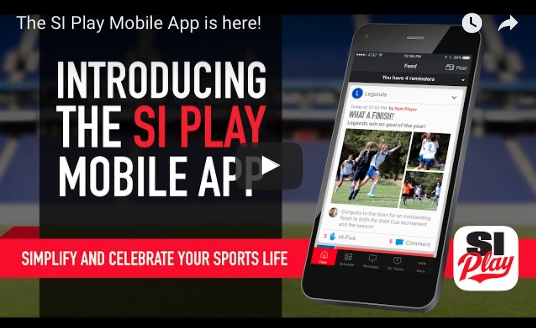 The new app is available for FREE on iOS and Android for all Rye Brook Youth Soccer parents and coaches. The app is a great way to manage team communication, scheduling, attendance tracking, volunteer duties and last-minute notifications. There are also a number of “wow! Features” including unique player cards, easy sharing tools to post highlights and best sports moments, and an innovative Family Feed which allows parents to view all their children’s sports schedules from one place. Simply download the app your smart phone's app store and login using the same credentials (userID and password) you use to login to the Rye Brook Youth Soccer website. The below video provides a nice over-view of how the app works. The below video provides a nice over-view of how the app works.